Depending on the state in which you live, you may have different rights to property in the case of a divorce. In California, each party has the right to half of the community property in a marriage. This means that each party has the right to half of the property that was shared during a marriage, regardless of each party’s role in the marriage. The law that determines property rights during a divorce or legal separation in California is called Community Property Law. 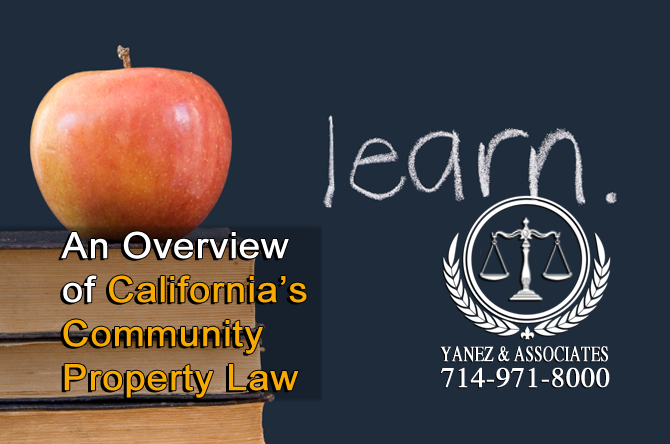 How can I learn about California’s Community Property Laws? Community property law says what happens to a couple’s property, debts, and assets during a divorce or legal separation. Property, under this law, is often used interchangeably with assets, both meaning something that the couple owns. Technically, assets are things that a couple owns that earn money, like a pension plan or a business. Property, on the other hand, is simply something that the couple owns, like a house, a car, or furniture. Debt includes anything that the couple owes, from credit card debt to car payments to a mortgage. Upon divorce or legal separation, all debts, assets, and property need to be divided into two categories: community property and separate property. Once categorized, community property will need to be divided between the two parties. For the purpose of this blog post, ‘property’ may refer to property, debts and assets, unless otherwise specified. Community property is defined as property that a couple shares. This means anything that either party has acquired between the date that they married or registered their domestic partnership up until the date of separation. There are a few exceptions to this general rule. • Property that is inherited by one party during the marriage or registered domestic partnership is not community property. • Property that was gifted to one party during the marriage or registered domestic partnership is not community property. • Property that is purchased with inheritances, gifts, or other separate property is not community property. Both parties to a divorce or legal separation have a right to keep an equal amount of all community property. Once categorized as such, it may require the assistance of professionals to help determine the value of all community property, assets, or debts. If you wish to protect your rights to an equal amount of property in a divorce or legal separation, make sure to work with a qualified divorce lawyer. Separate property is defined as property that belongs only to one spouse or partner. When a spouse or partner owns something or obtains something before the date of the marriage or registered domestic partnership, or when they obtain it after the date of separation, it is considered separate property. There are a few exceptions to this rule. • Property acquired through inheritance or gift to one spouse or partner during the marriage or registered domestic partnership is separate property. • Anything purchased with separate property is also considered to be separate property, as are funds from the sale of separate property, or anything purchased with that money. As separate property already belongs to one spouse and not the other, it does not need to be divided during a divorce or legal separation. Each party has the right to keep his or her separate property. One of the tricky issues that may arise is categorizing something as separate property in the first place. The date of separation may need to be determined in a separate hearing in order to accurately determine what is community property and what is separate property. Legally, a couple separates when they are no longer living in the same place, and when one party has officially decided to get a divorce. So, what may constitute as no longer living in the same place? In some instances, when one couple moves out of a shared home, they are no longer living together. In others, it simply means that the couples are no longer sharing a bed or a room, but may still be residing in the same home. Determining when one party has officially decided to get a divorce might mean knowing the date when he or she told the other party that a divorce was coming. It might be when one spouse contacted a lawyer, or it might be something else altogether. The date of separation is different for every couple, so if you have questions about yours, contact an attorney as soon as possible. In some cases, the difficulty lies in categorizing property as either community or separate. What happens when both separate funds and community funds were used to pay for a house or a mortgage? The equity in the home has been commingled, and is both community and separate. Always work with a professional to ensure that your property is appropriately categorized and divided. In other cases, the division of property can be difficult. Property and assets may be difficult to value, and when the couple does not agree on the value of a specific item, the process of dividing property can drag on. What happens when both parties want the same assets? What are a person’s rights regarding property when issues arise? 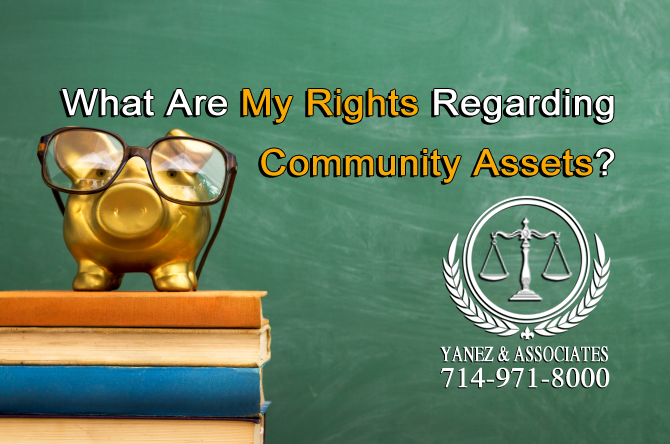 What Are My Rights Regarding Community Debts? I need to know My Rights Regarding Community Debts in my Orange County Divorce! Both parties are responsible for half of the community debts. There are many ways in which debt can be divided, and it can be used as payment for one couple taking certain property or assets. What if we have credit card debt? Community credit card debt, whether in the name of one spouse or both, is the responsibility of both spouses. It may be best to pay off credit card debt together before the divorce is finalized, because even a divorce settlement cannot stop a credit company from coming after one spouse in the instance that the other does not pay. Another option is for one spouse to open a new line of credit in his or her own name, and transfer the balance to that card so that the other spouse is not liable. What if I’m keeping our shared home? If one party is keeping a shared home, the mortgage will need to be paid off. Whether one spouse or both are responsible for the mortgage will be determined fairly, but the amount owed is the responsibility of both spouses equally. However, depending on the status of the existing equity in the home, one spouse may own more of the home than the other. It is important to work with a professional if you have questions. What Are My Rights Regarding Community Assets? I need help with Rights Regarding Community Assets? Both parties have a right to equal amounts of all community assets. Valuing assets, and their potential for earning can be complicated, and usually requires business, accounting or finance professionals. What if we own a family business? Depending on whether the couple owned a business together, one party played a role in the business and the other did not, or if either party owned the business with other outside parties, dividing a business can be tricky. Both parties have the right to half of their shared portion of the business. Pension plans are one of the most complex parts of property division. Always work with a finance professional if you or your spouse, or both of you, have pension plans. 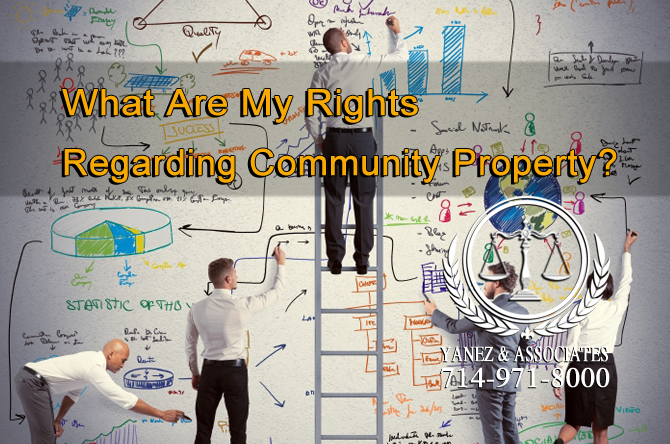 What Are My Rights Regarding Community Property? It is best to consult an attorney when trying to understand your Rights Regarding Community Property; for instance, some cases can be quite complex. Both parties have a right to equal amounts of all community property in a California divorce. Like assets, property may require a professional when it comes to determining values. What if we divided property when I moved out of our shared home? Even if a couple has divided property when they stopped sharing a home, both parties have the right to half of all shared property. If one party has more than the other, he or she may need to give some of that property to the other party. Does Spousal Support Affect Property Division? Will my Spousal Support Affect the Property Division? Spousal support and property division are two different parts of a divorce. If you have questions about how one could affect the other, always contact a professional attorney. In most cases, they will not affect one another, but in some cases, like when domestic violence is involved, spousal support and shared living spaces - including a shared home - may be affected. I need an Orange County Property Rights Attorney that understands my situation! 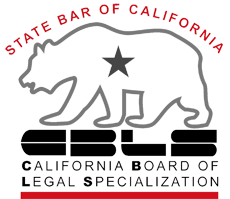 If you have questions about your property rights in your California divorce, contact an orange County family lawyer as soon as possible. At Yanez & Associates, we offer free initial consultations. Contact us today to schedule yours! 2.3 What is the date of separation? 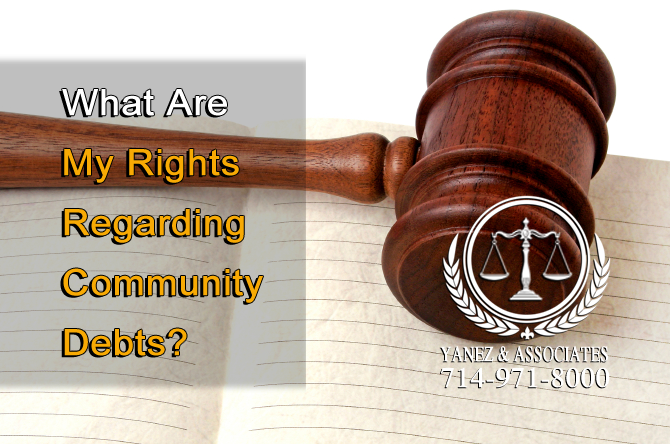 3 What Are My Rights Regarding Community Debts? 3.1 What if we have credit card debt? 3.2 What if I’m keeping our shared home? 4 What Are My Rights Regarding Community Assets? 4.1 What if we own a family business? 4.2 How are pension plans divided? 5 What Are My Rights Regarding Community Property? 5.1 What if we divided property when I moved out of our shared home? 6 Does Spousal Support Affect Property Division? An Overview of California’s Community Property Law, Community Property, Difficulties in Dividing Community Property, Does Spousal Support Affect Property Division?, I need help Understanding My Property Rights in a California Divorce, Orange County Property Rights Attorney, Separate Property, Understanding Your Property Rights in an Orange County California Divor, Understanding Your Property Rights in an Orange County California Divorce, What Are My Rights Regarding Community Assets?, What Are My Rights Regarding Community Debts?, What Are My Rights Regarding Community Property?